Sara Lee Peanut Butter Creme Cakes Giveaway! 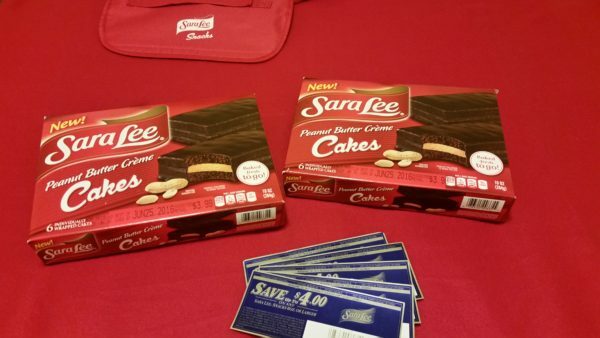 You are here: Home / Sponsored / Sara Lee Peanut Butter Creme Cakes Giveaway! 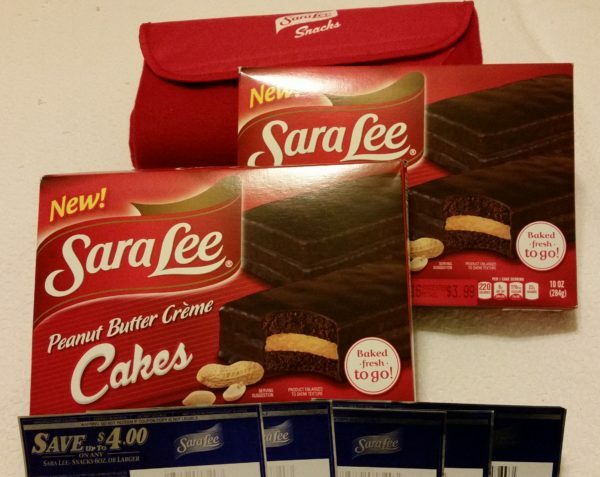 Sara Lee provided us with product to review and share with you! Sara Lee has introduced new Peanut Butter Creme Cakes! What’s not to love about that?! NOTHING, that’s what! They are moist Sara Lee cakes with a peanut butter filling wrapped in dark chocolate frosting. Oh My Goodness! They are individually packed and ready to go, with 6 cakes to a box they are great to have on hand for school or office lunches, snacks at home, or whip one out when you just want something for dessert! These snacks are the perfect size, not too big for kids and not too small for adults. How can you beat Peanut Butter and chocolate together? Well, my grandkids thought they were… AWESOME (say that all sing songy to get it right!)! So, that makes me the best Nana! lol Points for me! And now for the good news for you! We are giving away the same prize package I received to one of our lucky readers! The gift pack will have all the goodies you see above and all you have to do to enter is leave a comment with your favorite Sara Lee product and subscribe to my daily email. There are a few other ways you can get bonus entries also if you want. Good luck! To enter the giveaway, leave a comment telling us which Sara Lee snack is your favorite! The winner will be drawn at random. This giveaway will end Saturday, July 9th, 2016 at 11:59 pm Central time and the winner will be emailed soon thereafter. Make sure you add [email protected] to your address book, so you get the email if you win! They all sound great! I think my favorite would be the Brownie Chocolate Chip Snack Cakes! Sara Lee real butter pound cake is our family’s best favorite. We have it for birthdays and holidays. Nothing better than fresh picked strawberries and Sara Lee pound cake. We also adore Sara Lee pies that we bake at home. I love the Sara Lee Crumb Cakes. They are so delicious! I could eat the whole box of Sara Lee crumb cakes on the way home…if I went to a store not close by!! Ha!…did I say that outloud!! Ha! Thanks for the chance to win, Kiddo! My favorite Sara Lee of all time is New York Style Cheesecake. I could eat that all day long! They also make some smaller cheesecake bars that are great. I grew up with Sara Lee products. I am now 61 years old. They are the best! Crumb cakes, cheesecake, pound cake etc…. The brownie chocolate chip snack cakes sound awesome!! Sara Lee are quality products! I love the chocolate ones!! Yummy!! I love the crumb cake and the cinnamon rolls.